Thursday 5th April saw the start of the XXI Commonwealth Games in Gold Coast, Australia. England will be competing in Men's and Women's Artistic and Rhythmic at the Coomera Indoor Sports Arena. The Competition Schedule for Artistic can be viewed pdf here (134 KB) . (Please note that all timings in the Competition Schedule are Gold Coast timings - the UK are 9 hours behind). The BBC Schedule for showing the Gymnastics is attached pdf here (335 KB) . Results and performances, on a daily basis, will be posted below throughout the Games. Full Men's Team Results can be viewed pdf here (207 KB) . The Top 18 gymnasts (maximum 2 per Country) qualify for the All-Around Finals, which will take place on Saturday 7th April. See pdf here (118 KB) the Qualification Results for the All-Around. England's Nile Wilson (86.100) has qualified in first position, with James Hall (84.850) in second. An excellent second day of Gymnastics, with the ENG Women taking Silver at Gold Coast in the Team Final. For a very young and inexperienced Team, this was an outstanding result. Again, the Top 18 gymnasts (max 2 per Country) qualify for the All-Around Finals on Saturday 7th April. See pdf here (110 KB) the Qualification Results for the Women's All-Around. England's Kelly Simm (53.600) and Alice Kinsella (53.600) have both qualified for the All-Around in 2nd and 3rd Place respectively. What another amazing day at Coomera Sports Arena. With the Wilsonators out in force - they weren't disappointed. Both Nile Wilson and James Hall had the packed Arena on the edge of their seats and just kept getting better and better as the Rounds progressed. It all came down to the final Round on High Bar and Nile came away with a fabulous Gold and James Silver. What an outstanding performance from both England men. We are very proud and it was a wonderful site to see two England flags flying in the medal ceremony. For full Results, see pdf here (112 KB) . The Women's All-Around Final followed with Kelly Simm and Alice Kinsella representing England. The competition was extremely close throughout, with barely a point splitting the top six gymnasts going to Floor, the final apparatus. Alice Kinsella had an outstanding performance, bringing home the Bronze medal. Kelly Simm had a costly fall on Beam that hampered her medal chances, but still produced some impressive routines to finish in 5th place with 52.600. Well done England girls - you have had an outstanding day and have made us very proud. For full Results, see pdf here (103 KB) . Fabulous performances all round. Bring on the Indiviudual Apparatus Finals which start tomorrow. 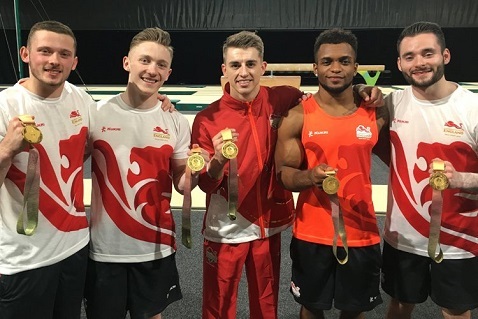 Today saw the England Men competing in the Floor (Max Whitlock MBE and Nile Wilson), Pommel Horse (Max Whitlock MBE and James Hall) and Rings (Courtney Tulloch and Nile Wilson) and the England Women competing on Uneven Bars (Georgia-Mae Fenton and Kelly Simm). Things didn't quite go to plan on the Floor, with Max finishing in 6th (13.333) and Nile in 8th (12.400). Full Results pdf here (80 KB) . Max showed his superb Pommel mastery, scoring 15.100 (the same score as Northern Ireland's Rhys McClenaghan). However, through the tie-break system, where Rhy had a higher execution score, Max ended up in Silver medal position. James Hall produced a tidy routine to score 14.066, taking 5th place. For results, click pdf here (80 KB) . 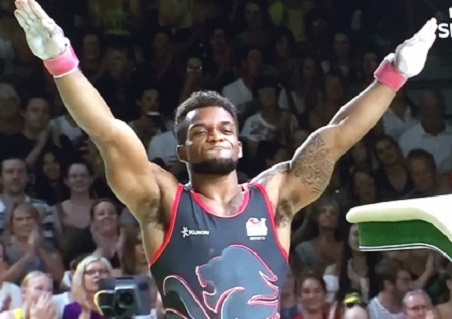 Finally for the Men - they saved the best for last with Courtney Tulloch showing all of his class; demonstrating his immense strength on the Rings and scoring a superb 14.833 and taking the Commonwealth Games title and Gold medal. Nile Wilson showed his usual flair, strength and skill, with a well-executed routine, scoring 14.400 and taking the Silver medal. Fantastic result again for the England Men. Results can be downloaded pdf here (79 KB) . England's Georgia-Mae Fenton and Kelly Simm took to the Uneven Bars and didn't disappoint. 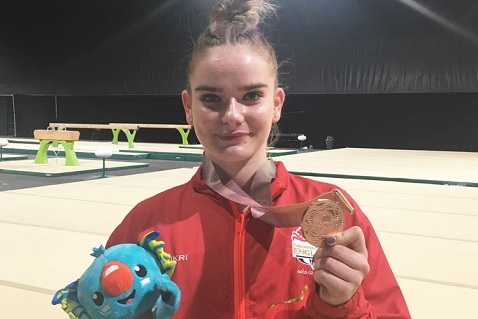 Kelly performed well, scoring 12.966 to take 6th place, but Georgia-Mae had a close to perfect routine, giving a sensational performance with a score of 14.600 - taking the Commonwealth Games title and Gold medal. Absolutely outstanding result for Georgia-Mae. Women's Uneven Bars Results pdf here (79 KB) . Today is the last day of the Artistic Gymnastics at the Commonwealth Games. 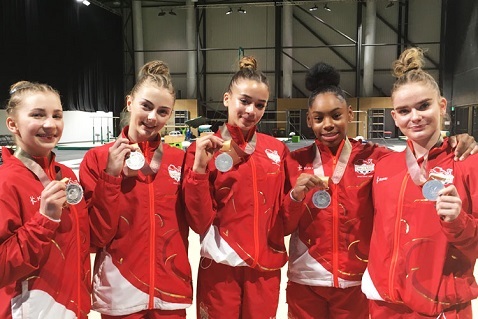 England's Men and Women have been competing in the Individual Apparatus Finals (Men - Vault, Parallel Bars, High Bar and Women - Floor and Beam). Courtney Tulloch and Dom Cunningham competed on Vault today and what a performance. Both performed exceptional Vaults, Courtney following up on his Rings Gold with a Silver on Vault. Teammate Dom Cunningham joined Courtney on podium to take a well-deserved Bronze. On this occasion, they were out-performed by Christopher Remkes from Australia who performed two exceptional Vaults to take Gold. Results pdf here (82 KB) . Alice Kinsella combined high difficulty with very precise execution to take a brilliant Gold for England in the Beam Final. Teammate Kelly Simm was also outstanding on Beam, having fallen in the All-Around Final. Kelly showed her class to take the Bronze medal behind her teammate. Brilliant performance from the England girls. Results pdf here (79 KB) . 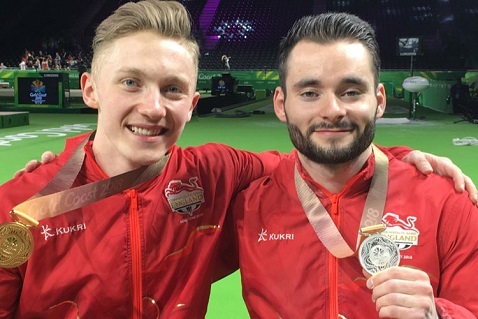 Nile Wilson gave a faultless routine, but was pipped to the Gold medal position as a result of the tie-break rules, which gave Georgiou (CYP) the edge on execution score. 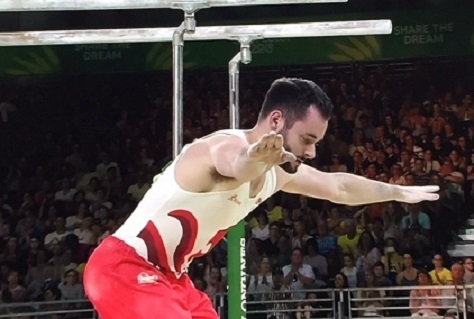 England's James Hall also worked well on the apparatus, but the competition was fierce and he took 5th place with a very commendable 14.100. 15 year old Taeja James showed she is definitely one to watch in the future and again demonstrated some high difficulty skills in her Floor routine. Unfortunately, two steps out cost her and she finished in 7th with 12.666. Teammate Alice Kinsella, last up, was unable to control her final tumble and placed 8th. Results pdf here (80 KB) . 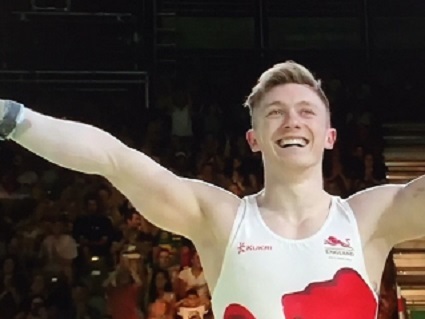 Nile Wilson ended the Games as he started, with a Gold medal on High Bar. His routine was World Class and almost faultless, scoring him 14.533 for his third Gold medal. James Hallwas also hugely impressive. He, once again, showed his consistency and skill to produce a superb, well-executed routine for 14.000 - taking joint Silver with Canada's Cory Paterson. Results pdf here (78 KB) . 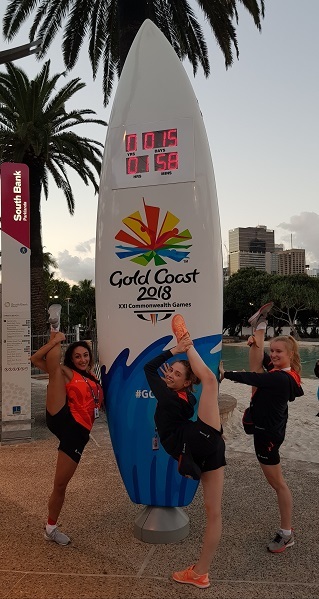 Starting Wednesday 11th April, the England girls (Mimi-Isabella Cesar, Stephani Sherlock and Hannah Martin) take to the floor for the start of the Rhythmic event. England will compete in Sub-Division 2. Mimi Cesar impressed the crowd with her hoop routine, that was full of confidence and well performed (score 11.050). Stephani Sherlock's high tempo routine was full of difficult skills; two unfortunate errors near the end costing her slightly (score 11.250). Hannah Martin showed great form in her hoop routine - England's youngest Rhythmic gymnast, opening her campaign with 10.850 points. With ball, Mimi performed with drama - her routine engaging the crowd with multiple butterfly leaps to score 10.950. Stephani had a nervy moment early on in her routine, but en ded with some beautiful work to score 11.050. Hannah Martin continued her confident qualifying with a superb ball routine for 12.300 to take her to the final. Mimi lost control of one club during her routine, but otherwise looked strong to score 9.100. Stephani also had some small errors but also executed some difficulty skills scoring her 10.450. Hannah's routine was full of energy (score 10.100). With ribbon, Mimi once again showed her trademark dramatic performance and scored 10.050. Stephani matched Mimi's score with 10.050 and gave a salute to the England fans as she left the floor. Last up for Team England, Hannah Martin performed nicely with a smile on her face, scoring 10.450. 15 year old Hannah Martin and Stephani Sherlock qualified for the All-Around Final and Hannah impressed, finishing in 7th place, with Stephani Sherlock in 14th. The gymnasts began their All-Around competition with the hoop exercise. Stephani had difficulties (score 9.500) and Hannah looked delighted with her excellently performed routine, which gave her a superb 13.250 marks. On the ball exercise, Stephanie completed a nice routine for 10.850 and Hannah's routine was joyous, a thumbs up to her coach confirmed how happy she was (score 12.000). With clubs, often the most testing apparatus, Stephani's routine was packed with difficult throw and catch elements, with one costly fumble mid-routine (score 10.350). Hannah's routine was full of energy. Sadly she couldn't quite grasp one club on the very last skill, but still scored an impressive 12.250. Finally, on the ribbon apparatus - Stephani finished with a nice performance for a score of 10.700 and total 41.400. Hannah continued her great final, scoring 11.850 for a total of 49.350 points. Hannah Martin qualified for the Individual Ball Final - Friday 13th April. Hannah Martin competed in the Individual Ball Final - an excellent performance with a score of 12.500 - finishing in a commendable 5th place.